ATTENTION: PUT A BATTERY CAN ALSO BE USED. 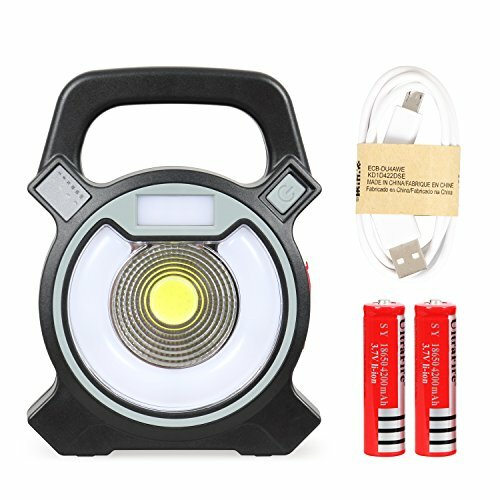 √ Super Bright -- Use the 18650 rechargeable lithium battery with 2 pack,1200LM. Changing time is about 3 hours and working time is about 5 hours. √ Lightweight & Portable Design -- USB charging design, easy to use. Not only as a lighting device, but also as a mobile power use. √ Special Used -- PUT A BATTERY CAN ALSO BE USED. √ 4 Modes -- The COB work light have 4 modes for your choice.Middle 5W COB Light; 5W COB Low Light; Round COB Light; Red & Blue Flashing. √ Applications -- Widely used for camping, travel, night outings on the beach, car installation, construction, night fishing, family emergency lighting, warehouses, parties, etc..